This title covers iconic primary documents from the 1600s to the present. Each entry offers the full text of the document as well as an in-depth, analytical essay that places the document in its historical context. 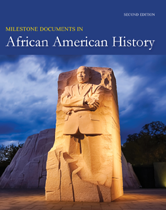 Among the sources included are important legislative documents such as the Reconstruction era amendments; critical Supreme Court decisions; and iconic speeches and writings by leaders such as Sojourner Truth, Booker T. Washington, Martin Luther King, Jr., and Barack Obama.